Maddie Bow Belt https://www.review-australia.com/au/maddie-bow-belt-blush-sparkle/RE17ACC030.REPNK109.html The Maddie Bow Belt features a gorgeous double bow design in sparkling blush pink. This belt offers endless outfitting possibilities, perfect for altering your silhouette and adding a pop of colour to your look. Wear high on the waist with an A-line dress for a feminine look. 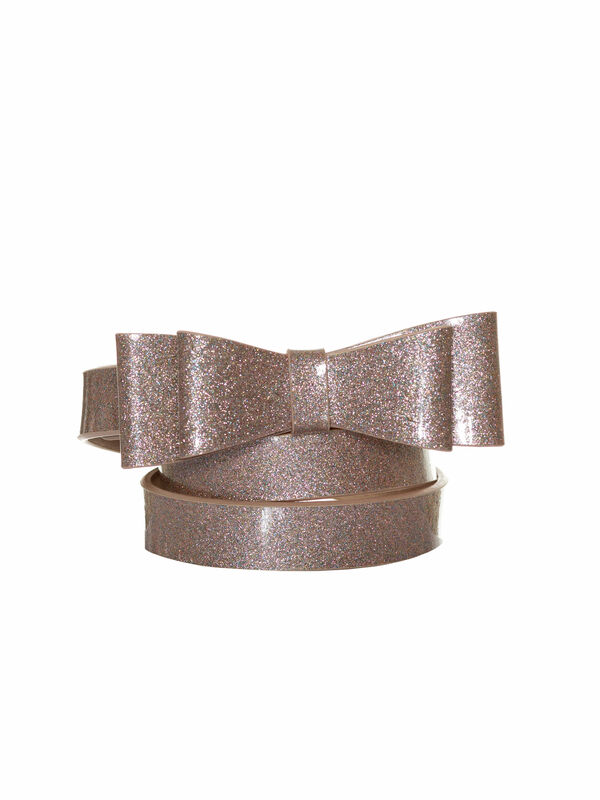 The Maddie Bow Belt features a gorgeous double bow design in sparkling blush pink. This belt offers endless outfitting possibilities, perfect for altering your silhouette and adding a pop of colour to your look. Wear high on the waist with an A-line dress for a feminine look. Maddie Bow Belt is rated 4.8 out of 5 by 44. Rated 5 out of 5 by WhatTrinityWears from Such a cute belt This cutie is definitely a favourite! I have many Review and non-Review belts but this one stands out - the range of colours is excellent and the design is adorable! At the suggestion of fellow Review-a-holics I sized up in this belt to hide the additional holes... while I would recommend this be wary that you may need to add an extra hole like I did! Rated 5 out of 5 by anastasiastarz from Lovely party belt! We've collected most of Review's bow belts over the years, and are delighted to finally add a quality glitter bow belt to our collection! These are quite rare. Perfect to add some sparkle to any outfit. Would love to see it in silver/cool tones and black, even purple shimmer would be amazing! Rated 5 out of 5 by Lisa19 from Awesome Colour I love the Maddie belts and especially love the colour of this, it matches so much of the new season items... I match mine with the Denim dress and Mint Sparky Cardi, This belt is a little bigger than others, I went down to a M, I normally get a L.
Rated 5 out of 5 by Chinalilly from Dress up any outfit Maddie belts are my favourite from Review. I love the classic bow shape and they pair so well with many outfits. I love the sparkly finish on this one. Be aware the belt it slightly larger then Maddies before, so you may need to size down. Rated 5 out of 5 by Nazia from Awesome Product! I bought this a week back and it is amazingly high quality and the product matches the color and material mentioned online. Highly satisfied and recommended brand. I love the packaging and details of the product shipped online. Rated 5 out of 5 by The Kitten Within from Just the pop of colour you NEED this winter! This belt is stunning! The sweet bow, the pop of classy yet bright colour - must have this winter! Pair with a cute black top and printed skirt and highlight your waist gorgeously with this piece! Rated 5 out of 5 by Krissy from Lovely Colour and Adorable Bow This cute mint green bow will go with lots of Review outfits I have to added a slightly different look. Size 6 in most Review clothing and the XS belt size fits fine.